In the early 1980s, Ray-Ban, once an incredibly popular brand of sunglasses, were selling only 18,000 pairs a year. By the end of the ’80s, the brand was resurgent, selling millions of pairs all over the world. In large part, this was thanks to Tom Cruise. Cruise was the biggest movie star in the world and when he graced the silver screen, it was usually in a pair of Ray-Bans. Risky Business brought back Ray-Ban’s Wayfarer in 1982, and then four years later, Top Gun did the same thing for the aviator silhouette. Of course, that is the simplified version of the story. Naturally, the history of aviator sunglasses doesn’t begin and end with Tom Cruise. The popularity and cultural meaning of the aviator is actually closely tied to public perceptions of the American military. If you look at the sunglasses throughout the 20th century, you’ll find that the fortunes of the military industrial complex and aviator sunglasses are closely linked. Tom Cruise is far from the only celebrity to don a pair of Ray-Bans, but if you understand what Top Gun meant to aviator sunglasses, you can start to understand the place Ray-Bans hold in American culture. Like a number of other American fashion trends, aviators came to be, not because of fashion trends, but because of military necessity. During World War I, innovation in flight allowed pilots to reach new altitudes, and with this new development came unforeseen dangers. Flying higher meant more exposure to the sun’s rays (hence the name “Ray-Ban”) and the chance of eyes freezing from extreme cold. Routinely, pilots would have to bail out of missions with strained eyes. Classic fur-lined goggles proved incredibly inconvenient and Bausch & Lomb stepped up to develop new sunglasses that would meet the standards of America’s aviators while being a little easier to slip on and off. The company developed a stylish model that cut down on glare and offered and extended teardrop shape for better eye protection, offering coverage of the whole eye socket. The aviator was born, even if it would be a few years before the company would officially adopt the term. As Tom Cruise would repeat fictionally decades later, it was identification with the military that first made the glasses a cultural phenomenon. A picture of General Douglas MacArthur returning to the Philippines towards the end of World War II, fulfilling what he viewed as a promise and a prophecy went the 1940s equivalent of viral; in that photo, the general was wearing aviators. Aviators quickly became popular among civilians, a symbol of masculine strength and post-World War determination, and models like the “Outdoorsman” and the “Shooter” were aimed at specific segments of the population. In the short term, this was incredibly profitable for the company, but the military, technical association isn’t what stuck for Ray-Ban—at least not as the post-war decades went on. As America began to get involved in wars that were less popular and public sentiment in favor of the military decreased, Ray-Bans slowly became a symbol of the counterculture and discontent with the American status quo both at home and abroad, just like Army jackets and combat boots did during the same period. The first step in this direction came in 1953 when Marlon Brando wore a pair in The Wild One, which was also the year that the Korean War came to a close. Peter Fonda wore aviators in Easy Rider (1969) and Robert De Niro wore a pair in Taxi Driver (1976). John Lennon and Iggy Pop would be photographed wearing the shades, along with various other rock stars of the era. Gloria Steinem would make aviators a facet of the women’s liberation movement in the early-’70s. Steinem went as far as to call her oversized version of the glasses “a tool to prevent objectification,” and “a barrier between her and society.” Hunter S. Thompson would forever connect aviators to his Gonzo aesthetic, pairing them with his famous bucket hats and Hawaiian shirts. Aviators were popular, but no thanks to the victorious posturing of military figures like General MacArthur. As the counterculture shifted, Ray-Ban faltered. Aviators didn’t quite fit the stripped down aesthetic of punk or the glitz of disco. Sales declined sharply in the late-’70s. By the early-’80s Ray-Ban brass realized they would have to be aggressive to survive. The company was going to have to change the way they approached marketing. As noted in The Guardian the Ray-Ban of today discovered that sunglasses customers are returning customers: [90 percent of customers](https://www.telegraph.co.uk/fashion/style/ray-bans-aviator-sunglasses-went-military-essential-film-star/ who bought aviators would ultimately go on to buy a second pair. Sure this stat may be contemporary reporting, but a history of this thinking meant that, for the brand and its aviator silhouette back in the day, a big advertising investment could pay dividends. It was decided that product placement was the way to go, because product placement was still a relatively new phenomenon. Names like Nike and Pepsi pioneered an era of product placement with Back to the Future and Ray-Ban took its gamble later that year. While Cruise’s turn in Risky Business would be the first breakthrough for the company, it was far from the only movie where Ray-Bans appeared in that era in Hollywood. Ray-Bans appeared in upwards of 160 movies in the mid-’80s. Despite a variety of investments, Cruise proved to be by far the most effective agent for increasing sales. After paying only $50,000 to place Wayfarers in Risky Business, sales increased exponentially. When Top Gun opened in 1986, sales of aviators increased by 40 percent. While this is an impressive number on its own, it is the sustained growth that the line enjoyed that is most impressive. Aviators maintained double-digit growth in successive years, eventually becoming the perennial fashion staple they are today. But it wasn’t just the presence of Cruise in Top Gun that boosted the profile of the aviator. Top Gun wasn’t just any Cruise vehicle; it was a flash point for a cultural shift in how the American public viewed the military. In the years of the interminable Vietnam Conflict and the rise of late-’60s and ’70s counterculture, the military—and, by extension military style—was not cool. 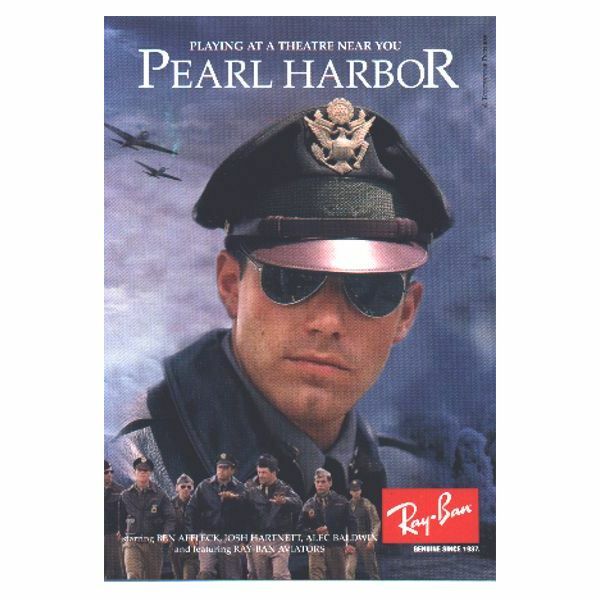 Around the same time that Ray-Ban began investing in product placement, so did the US military. The Pentagon put out an offer: They would be happy lend support and equipment to war movies so long as they control the way that war was portrayed. Hollywood took part in this rehabilitation campaign in exchange for deep discounts on military equipment and advisors for war movies. Top Gun was only charged $1.8 million for the use of “four aircraft carriers and about two dozen F-14 Tomcats, F-5 Tigers and A-4 Skyhawks, some flown by real-life top-gun pilots.” The real life cost of those kind of resources is almost incalculable for a civilian project. In return, it was expected that the filmmakers would take notes—or direct edits—from the military. For example, the Navy asked that Goose die from an ejection malfunction rather than a midair crash. American military support for the “right kind” of war movie continues to this day with the expectation that the “military entertainment complex” will be able to put its stamp of approval on the script and final product. At least in the case of Top Gun, the military received a substantial return on investment. An LA Times article from 1986 reported that one recruiter estimated that 90 percent of naval aviation applicants following Top Gun had seen the movie. Numerous sources describe recruiting stations being set-up outside of movie theaters. All branches of the armed forces saw a combined 20,000 person boost in enlistment in the year after Top Gun was released; 16,000 of those recruits were in the Navy. The military was cool again and that meant that military style clothing and accessories were cool again. A now-ubiquitous Bomber jackets were back in fashion and, by the end of the 1980s, Ray-Ban was selling millions of units per year. Not only had the brand become synonymous with the face of one of the most bankable stars in Hollywood history, but aviators had regained its status as a paramilitary accessory par excellence. Though the sunglasses were worn in the military for decades before Top Gun, veterans report that they became a coveted status symbol after the film’s release, creating one of American culture’s strangest feedback loops. Ray-Ban seems to have seen this coming. While in most Cruise movies of the era, only the star is sporting Ray-Bans, in Top Gun, every major active military character is outfitted with a different model; Goose (Anthony Edwards) wears Ray-Ban Caravans while Iceman (Val Kilmer) wears Ray-Ban Shooters. Given this multi-faceted (pun not intended) history, it is easy to understand why aviators appear in such varied places in modern men’s style. aviators are still a masculine symbol, essential for projecting the image of the grizzled veteran or the hardass sports coach. At the same time, they are still favored by some rock stars and artists. The sunglasses appear in Almost Famous as a symbol of countercultural rock ‘n roll rebellion, but they also appear in Pearl Harbor as an essential accessory of those embodying self-sacrificing patriotism. Today, aviators can symbolize pretty much whatever you want them too. But, if history is any indication, the place of these sunglasses in the broader culture could change just as quickly as the whims of Pentagon top brass.